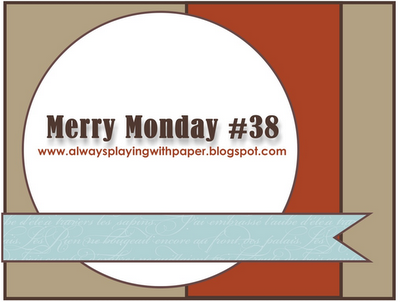 I wanted to play along with Merry Monday, and also wanted to do another card for the Jingle Belles challenge. 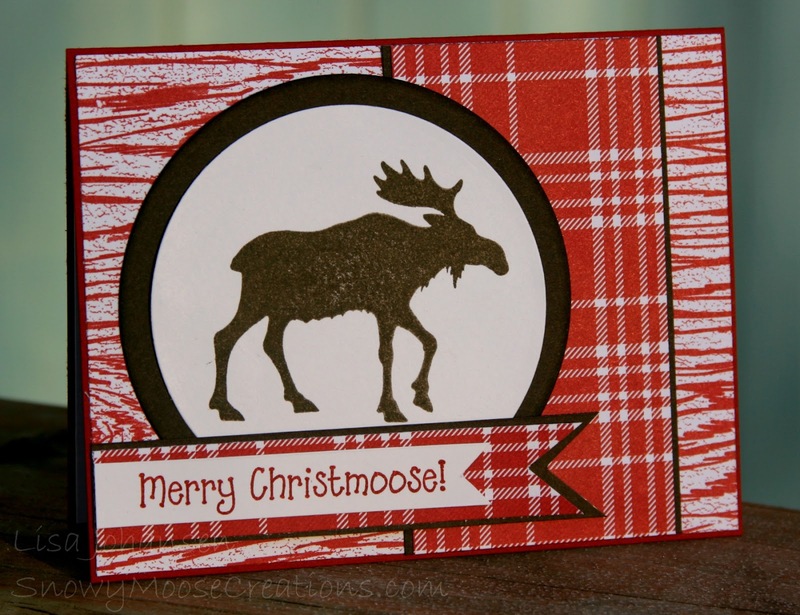 I was going to use penguins this time but I still had my moose stamp out and just couldn't resist it, so here is another moose. 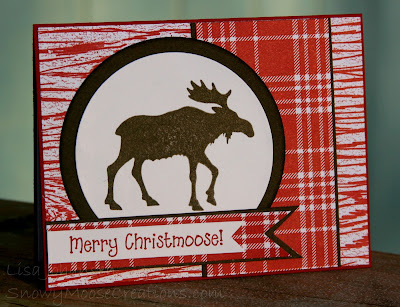 This card uses the sketch from Merry Monday, which I'm squeaking in before the challenge closes, and the Jingle Belles challenge to create a card with a living creature. I used the same DSP set as the last card, just changing up it up to predominantly red with a touch of brown. I was going to add some red glitter on the nose of the moose for a Rudolph effect but I decided against it. I like the rustic look the card has as-is. Love the moose with plaid ... another great Creature Feature design. He's such a stately looking creature and shows off beautifully with this paper! Makes me think of curling up in front of a fire with a warm plaid blanket looking out a big picture window. Thanks for stimulating my imagination, Lisa! And for sharing with us at Merry Monday! Another great moose motive! Such wonderful cards. I know what you mean about the lighting... dificult in winter. LOL....when I saw this card in the gallery, I just KNEW it was yours! So cool...esp with those papers! Thanks for sharing this with us this week at Merry Mondays! Fantastic card Lisa, love the moose. Thank you for joining us for Merry Monday this week. Cute card. Thanks for playing with us at Merry Monday! Adorable card Lisa! Love the sentiment! So much fun! Thank you for joining us for Merry Monday this week.